Providing you the best range of printed kurtis, block print kurti, blue printed kurti, fancy butterfly printed kurti, multi print kurtis and multicolour fancy printed kurti with effective & timely delivery. In order to comprehend and meet the diverse demands of clients, we are able to offer an extensive array of Printed Kurtis. 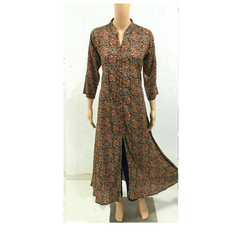 We are one of the leading manufacturer and supplier of Double Layer Ikkat Print Kurti.We obligated to meet the quality standards as per the customer demands. In order to comprehend and meet the diverse demands of clients, we are able to offer an extensive array ofBlue Printed Kurti. In order to comprehend and meet the diverse demands of clients, we are able to offer an extensive array of Black Fancy Printed Kurti. We are the prominent and leading organization actively engaged in offering an extensive array of Multi Print Kurtis. These kurtis are designed under the guidance of skilled designers using finest quality fabric and sophisticated machines in adherence to set industrial standards. We offer these kurtis in various shades, printed designs, colors and patterns for our clients to choose from. 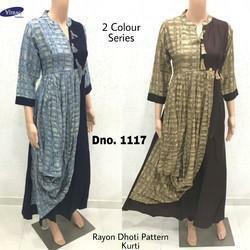 Clients can avail these kurtis from us at market leading prices. In order to comprehend and meet the diverse demands of clients, we are able to offer an extensive array of Multicolour Fancy Printed Kurti. In order to comprehend and meet the diverse demands of clients, we are able to offer an extensive array of Multicolour Printed Kurti. In order to comprehend and meet the diverse demands of clients, we are able to offer an extensive array of Printed Heavy Kurtis. We are known for offering an elegant collection of Printed Kurti. 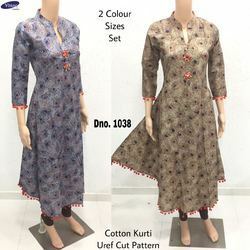 The offered kurti is designed with the help of finest quality fabric and technically advanced machines in compliance with set industrial standards. This kurti is offered in various customized designs for our clients to choose from. Our offered kurti is worn on parties and celebration by ladies. 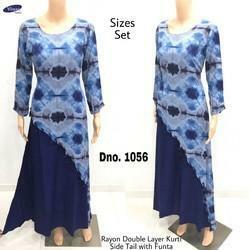 Clients can avail this kurti from us at market leading prices. We are devotedly engaged in offering elevated range of Exclusive Printed Kurti. 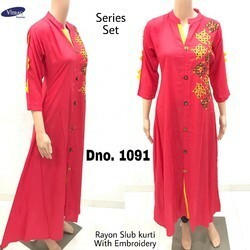 The offered kurti is designed using extra soft quality fabric that is sourced from trusted vendors in the market and ultra modern technology in compliance with set industrial norms. This kurti is worn by ladies and girls to the function, parties, celebrations and many such occasions. 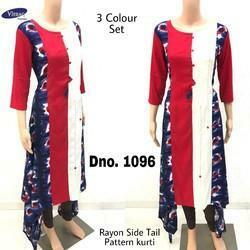 Our offered kurti is made available in various specifications for our clients to choose from. In order to comprehend and meet the diverse demands of clients, we are able to offer an extensive array of Printed Ladies Kurtis. In order to comprehend and meet the diverse demands of clients, we are able to offer an extensive array of Red Printed Kurti. Having beautiful embroidery work on neck pattern, our offered suit imparts fabulous look and style after wearing. In compliance with the latest fashion trends, the offered designer silk suit is creatively stitched by our creative designers using the latest stitching techniques. Besides this, provided silk suit is available in different colors and patterns to cater the exact requirements of clients. With our rich industry experience, we are engaged in offering MODERN PRINT KURTI to our clients. The offered suits are designed and stitched by a skilled team of designers using high grade fabric and other basic material, sourced from reliable vendors of the market. These suits are highly demanded in the global market for its sizes, shapes and designs. Clients can avail our offered from us as per their precise needs. With our rich industry experience, we are engaged in offering party wear kurti to our clients. The offered suits are designed and stitched by a skilled team of designers using high grade fabric and other basic material, sourced from reliable vendors of the market. These suits are highly demanded in the global market for its sizes, shapes and designs. Clients can avail our offered from us as per their precise needs. Being the leader in the industry, we manufacture, supply export top quality Kalamkari Printed Kurtis. The fabulous all-over print makes this Kurti a must have in every design conscious women collection.